Kogan is offering JB Hi-Fi customers a free HDMI cable. In the latest of a series of publicity stunts, online retailer Kogan is offering "tricked" JB Hi-Fi TV buyers a free HDMI cable. Anyone who has bought a TV at JB Hi-Fi so far in 2011 is able to redeem a free HDMI 1.4 cable from Kogan by sending proof of purchase via email. The discount online retailer, which has a history of challenging big brands with budget products, will send any recent JB Hi-Fi customers who purchased a TV a Kogan-branded HDMI cable for free, with no shipping or handling charges. 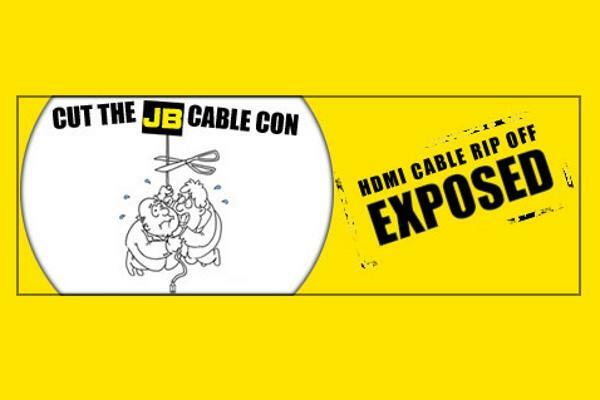 Kogan claims this latest move is in order to expose what it calls a "con" by national electronics retailer JB Hi-Fi — according to Kogan, JB Hi-Fi tricks consumers into "thinking they need a $200 cable" for their new plasma or LCD TV. HDMI and other video cables traditionally have the highest price mark-up in retail stores, and a commonly accepted retail sales strategy is to ask buyers if they require an HDMI cable for their new televisions. According to Kogan founder Ruslan Kogan, the practice is deceptive: “Some retailers have decided that it’s appropriate to trick unsuspecting Aussie shoppers into thinking a $200 HDMI cable is somehow better than a $3 cable. What they conveniently forget to tell you is there's no difference in picture quality between Kogan’s $3 cable and one more than 60 times its price. "At Kogan, we think it’s extremely unfair for someone who shells out their hard-earned money on a new TV to be shafted on cables and accessories because of a deliberate misinformation campaign by the big retailers." JB Hi-Fi's online store displays a number of HDMI cables in a range of lengths, with the cheapest being a $69 Soniq-branded 1.5m cord. Kogan only offers a single HDMI cable — three metres long for $3. Online accessories retailer EzyHD offers low-priced cables from 50cm to 5m, with lengths from 5m to 20m using especially thick gauge wire, at an additional cost, to reduce the chance of interference or signal disruption. The Kogan Web site tells consumers: "You shouldn't be spending more than $10 on an HDMI cable!" A spokesperson from EzyHD weighed in on Kogan's claims about cable quality: "There are so many different HDMI cables out there these days — some of dubious quality — that to say 'don't pay more than $10' is rubbish. The difference in price is in the build quality... however, there is no need to spend more than, say, $50 on a well made 2m HDMI cable. Any decent HDMI [cable] should come from a qualified HDMI adopter, then at least the buyer will know it meets proper HDMI manufacturing standards." According to a Kogan representative, the response to Kogan's free HDMI cable offer has been "tremendous" despite only being announced this morning. Kogan won't be offering free HDMI cables to its own customers any time soon, though — Kogan's representative told PC World Australia: "Kogan customers have been getting the best deals on TVs for years, and can buy a Kogan HDMI cable for only $3 anyway." However, the online retailer is considering extending the offer past March 31 based on consumer demand. Kogan recently unveiling its LivePrice pricing scheme which lets customers trade a longer wait for shipping against lower purchasing prices. LivePrice has been a success so far in Australia, with $320,000 of products sold on the service's launch day alone.